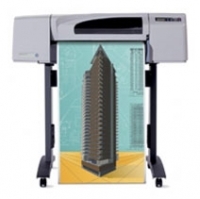 The 42" HP DesignJet 800 is perfect for architectural firms, engineering departments and other technical groups relying on fast, accurate illustrations, precise line drawings, and high-resolution renderings. HP DesignJet 800 Series plotters are network-ready, and contain a "virtual computer" inside, which boosts productivity by doing all of the file processing work, thus, freeing up the computer quickly. 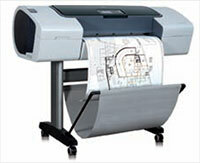 The 800&apos;s precise ink placement technology ensures crisp, sharp lines and text. 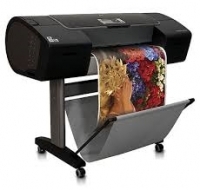 As you combine the great features of this plotter with HP&apo;s color layering technology, you can create smooth color transitions and photo-quality results. 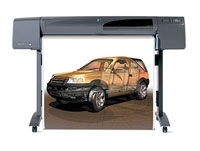 HP DesignJet T1100 24" & 44"
HP DesignJet T1100PS MFP 44"
Prints most CAD applications on a wide range of operating systems are supported, thanks to embedded HP-GL/2 and RTL, PostScript models adds Adobe file processing on the printer. 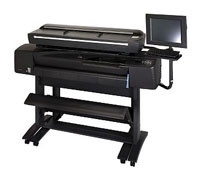 MFP unit has 36"-wide HD scanner. May be used independent of printer. 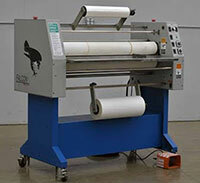 Up to 38" roll lamination, GBC Falcon 39” laminating material: uses heat activated and pressure sensitive materials 0-38", on a 3" core up to 10" diameter. Speed up to 18 fmp. Requires 220V AC50 or 60Hz phase 30A.